A New Look At 'Iliad' In 'The War That Killed Achilles' Homer's epic poem "The Iliad" dates back thousands of years, but author Caroline Alexander says its themes, especially about war, ring true today. Guy Raz talks to Alexander about her new book, The War That Killed Achilles: The True Story of Homer's Iliad and the Trojan War. Homer's epic poem "The Iliad" dates back thousands of years, but author Caroline Alexander says its themes, especially about war, ring true today. Guy Raz talks to Alexander about her new book, The War That Killed Achilles: The True Story of Homer's Iliad and the Trojan War. One new book you can buy for either the Nook or the Kindle, or even an old school ink on paper is "The War That Killed Achilles." In it, author Caroline Alexander explores the real world events that inspired Homer's epic poem, "The Iliad," and how the lessons of the Trojan War resonate on the battlefield to this day. Caroline Alexander, welcome to the program. Ms. CAROLINE ALEXANDER (Author, "The War That Killed Achilles: The True Story of Homer's Iliad and the Trojan War"): Thank you very much. RAZ: At the beginning of the book, you write: The greatest war story ever told commemorates a war that established no boundaries, won no territory and furthered no cause. And yet, it's the greatest war story every told. Ms. ALEXANDER: Correct. Certainly in the ancient world, you have later historians who say completely matter-of-factly, well, you know, the Trojan War essentially destroyed the Greeks and yet we know the Greeks were the victors. There wasn't a whole lot left of Troy when that city fell for the victors to gain on the one hand. And they'd been so long at this wretched war, 10 years, on other hand, that it sort of drained them. And certainly, the Greeks never settled at Troy, so they didn't win that land and it just sort of all kind of fizzles away. What Homer's "Iliad" is saying is that even heroic wars can be pointless. RAZ: A big part of "The Iliad" is about, as you write, insubordination. It's about whether a warrior, like Achilles, subsumes his personal freedom when fighting for a bigger cause. And yet, you write that Homer's conclusion on that question is unclear. Ms. ALEXANDER: Well, I think that this is one of the great enduring questions of war as, indeed, many of the questions that are posed by "The Iliad" are. And the reason they're enduring questions is they're never quite answered. Ms. ALEXANDER: What's interesting is that this is a question that's raised at the very outset of the epic. And in Book One, in the early lines of Book One, we already have a confrontation between Achilles and his commander in chief. Amongst the things that he says very forcefully is the Trojans didn't do anything to me. Ms. ALEXANDER: He's speaking right there the soldier's dilemma, whether they're an outstanding hero or demigod or just an ordinary soldier in the ranks. This is always the problem that the war is not always personal for the men who are actually fighting it. RAZ: The comparison you make is with Muhammad Ali's famous challenge to the U.S. government during the Vietnam War when he refused to serve. And he said, I ain't got no quarrel with the Vietcong. It's the same thing, you write. Ms. ALEXANDER: Muhammad Ali is one of my few living heroes so I guess I had to work him in some how. Ms. ALEXANDER: But it's always struck me that, that was a heroic stance and his words were heroic. And I think that by showing a modern example, which is charged politically, it was a way that I felt would underscore that these words Achilles was speaking were highly dangerous and very political. This wasn't just the sort of pretty mythic speech. RAZ: You chose to write this book, I read, in part because of the invasion of Iraq. Ms. ALEXANDER: I don't know. I don't think that that's fairly true. I think it is fair to say that "The Iliad" has always been to me, very relevant and very personal. And once we entered a war period, in our own historic times, I saw as I've always seen resonances between certain events that I was reading about and things that I knew from "The Iliad." RAZ: This is a few years ago. Ms. ALEXANDER: Is being killed. RAZ: ... the walls. Is "The Iliad" a kind of a cautionary tale for us and for the way we think about warfare? Ms. ALEXANDER: Homer's work is not an antiwar screed. He's no more rails against war than he rails against mortality. They both seem to be tragic facts of our existence. And the proof of that is this work draws on traditions that date back to maybe 1600 B.C. And yet, every scene in here that we're discussing - I might have to explain to you some of the names or some of the, you know, historical data - but I don't have to explain any of the emotional impact or any of the events that have happened. They are as fresh and real today as they were when they were composed. And that is a terrifying thought when you think how old this work is, because it means nothing has changed. And I wish it were as simple as the fact that on could say, oh, okay, well, war is terrible and we'll never do it again. But I think Homer's lesson, unfortunately, is this is the way of the world. 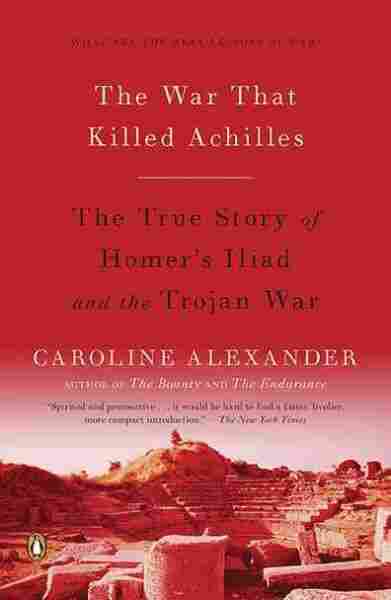 RAZ: Caroline Alexander is the author of the new book, "The War That Killed Achilles : The True Story of Homer's Iliad and the Trojan War." She joined us from WGBH in Boston.